Despite the aggravations of air travel, I still love the airport. People are going places, things are happening. 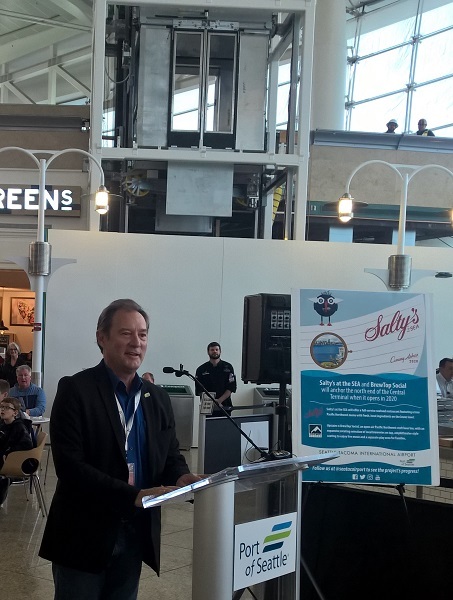 Airports everywhere are trying to better the traveling experience, and Sea-Tac is on the leading edge in terms of including small, local businesses in the process. A media moment was shared on March 29 to showcase the Central Terminal's first phase completion, which includes five new eateries. Dawn Hunter, Senior Manager, Airport Dining and Retail, is thrilled with what's happening. "One of the reasons I love my job is that we can go out into the community and bring it here to be reflected inside the airport. There's so much to choose from." Also on hand was Port of Seattle Commissioner Peter Steinbrueck (photo). "This is a good news day at the airport. There has been unprecedented growth in air travel through Sea-Tac. There have been lots of challenges, and we are committed to making the travel experience our number one priority. We have to operate efficiently." He also announced that as of March 31, Japan Air Lines will begin service to Narita, Japan; Cathy Pacific to Hong Kong; and Delta will offer seasonal services to Osaka, Japan. All are non-stop flights. "We're an international hub to Asia," he continued. "We're investing $3.7 billion in facelifts, implementing changes from 2017-2022. One of our biggest projects now is the enhancement of the International Arrival Facility. We're also in the process of redoing the baggage handling to increase efficiency. Every 90 days you'll be seeing something new at the airport." Much of this first phase, and part of the reason it took 402 days to complete, has to do with behind-the-scenes work. New HVAC systems and reconfigured tenant spaces were installed, and an elevator and stairs are being added. Only after that could the tenants take over construction of their locations. Now you're back to seeing the view of the tarmac and beyond from the huge windows, and there is all new furniture. The North Satellite is being modernized and there are new eateries there as of this spring, including Bambuza Vietnamese Kitchen, a family-owned, Portland-based brand that originally started in Seattle. It's the first Vietnamese concept at the airport. Caffe D'arte, a locally-owned Italian coffee roasting company serves espresso, drip, pastries, sandwiches, and snacks. And Skillet with its elevated comfort food made with local ingredients and from-scratch cooking. From 2019-2021, the airport will add or upgrade 1.2 million square feet, allowing more space, improving safety, and meeting regional needs. 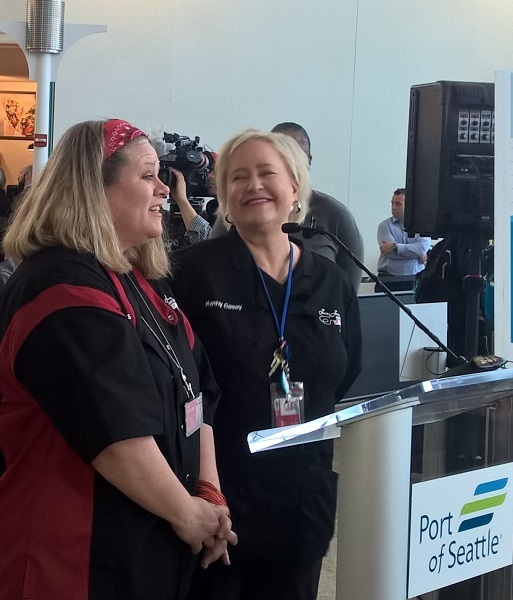 Lucky Louie Fish Shack, a fast casual seafood concept by Seattle partners Chef Kathy Casey (right) and Managing Partner Stacy House (left). "We are a woman-owned small business, and the Port/airport made our being here possible," Kathy says. "It's been a great process. Growing up here, I loved going to fish and chip joints during summer trips to the beach. 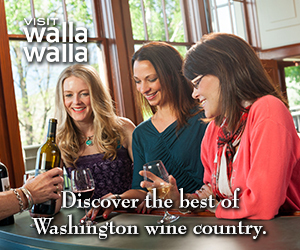 Stacy and I are sharing these nostalgic, local flavors with travelers." Their fish is sustainable and wild Alaska Pollock, and they offer creamy gluten-free chowder, honey teriyaki salmon, and Shrimp Louie salads. Don't get misled by "Sweet Waffle Fish," their sweet treat. No fish is involved, other than the shape of the waffles filled with cheesecake. Since I was there, basically my hands were tied and I needed to try the fish and chips. No matter that it was 10:27 a.m. Who cares about time at the airport? The fish was moist inside and the crust crispy. The tartar sauce was perfect with the fish, and ho hum on the fries which I say as a compliment. They've got the fish/tartar pairing down. Use catsup on those crinkle fries! Evergreens is also a local company that offers meals made with fresh and responsibly-sourced ingredients: salads, wraps, grain bowls. 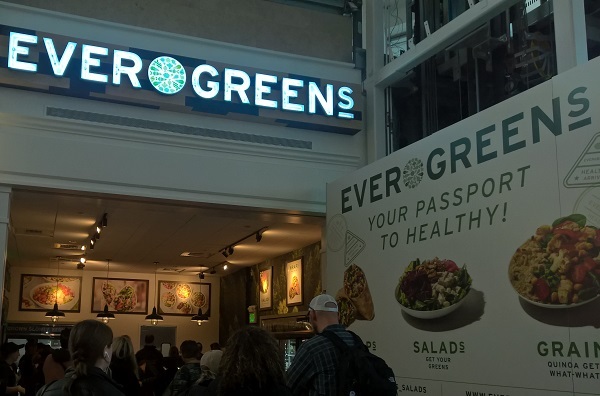 President and Co-Founder Hunter Brooks says, "This is a dream come true to open a healthy fast casual restaurant at the airport. 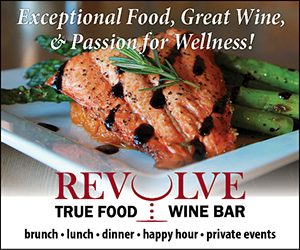 We offer all natural food from the earth and are so happy to bring travelers healthy options and convenience. We are adding some new menu items, too, soups and both sweet and savory breakfast items. We will also have online ordering via a mobile app and on our website. That way, if you're on your way to the airport and know you have limited time, you can order ahead and pick up and go." 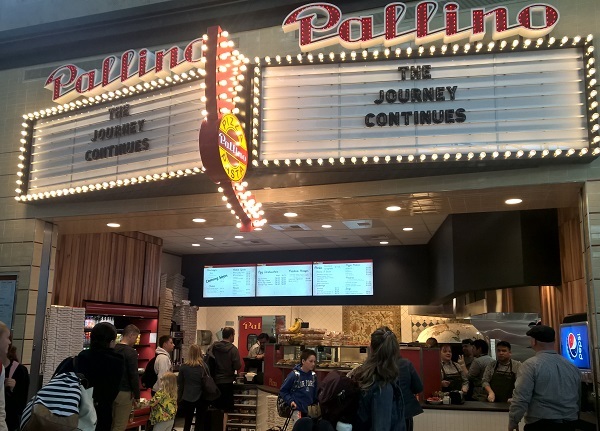 Pallino Pastaria has had a presence at the Central Terminal since 2005 and is back as a longtime passenger favorite. "The airport is a unique place to run a business. During this process we've had an enthusiastic sharing of viewpoints," laughs Managing Partner David Montanaro. "But we never doubted the Port's commitment and support, and we have great camaraderie. We can be the first and last impression for travelers, so we want to offer outstanding food and hospitality. 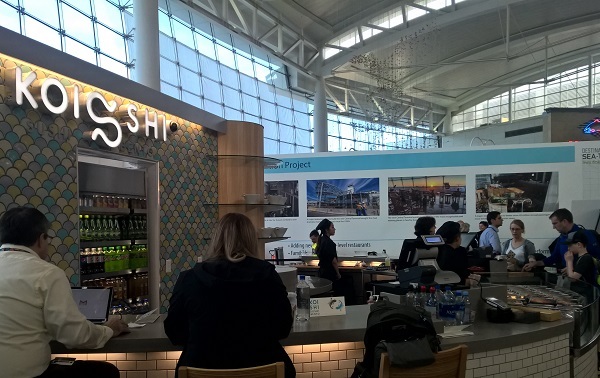 I'd love to hear people say that the best Italian food in Seattle is at the airport!" The other new eateries come from larger, non-local companies but will undoubtedly be very popular. One is Pei Wei Asian Kitchen from the culinary experts at P.F. Chang's who envisioned a restaurant serving Asian-inspired dishes without compromising freshness for speed of service. Look for rice, noodle, salad bowls; lettuce wraps; sushi. Dishes can be customized for diets, including gluten-friendly and vegetarian. Koi Shi Sushi Bento offers made-to-order Japanese items, including sushi, sashimi, and create-your-own bowls. There are grab-and-go options like bento boxes. This is the only outlet in the Central Terminal with its own seating, a high-top sushi bar. Salty's at the SEA and BrewTop Social will anchor the north end of the Central Terminal when it opens in 2020. We've been hearing about changes coming to the airport for a long time; it's wonderful to see some of them in place. Each new eatery had a line of guests today. Success!